Sourdough Saga: Episode 2 – keep calm and carry on? I started initially with rye flour again, but used bottled water this time. My initial batter was far too thin (I started with equal volumes of flour and water rather than equal weights – not quite sure what I was thinking really! ), on day 2 when I got the initial bacterial bubble-up the whole thing split like curdled milk. Thanks to some more supportive advice from twitter, I didn’t panic. Keep calm and carry on, so they say. Too much water, not enough flour, feed and perhaps move somewhere slightly cooler. Done. Do all starters get talked to this much? Never has an inanimate object of mine been so cajoled & pleaded with. I speak to it softly, encourage its efforts, and wish it goodnight and good morning. My husband wonders if I’m losing my marbles… if only just a little bit! I got my hands on some locally stoneground wholemeal flour, so I switched to this for feedings. As the batter was still on the thin side, I didn’t pause for doubling at day 3, but carried on with daily feeding. Because the material on the sides of the jar was the first to grow mould last time, I made a habit of swilling out the jar to clean the sides at each feeding. The smell was good (quite yeasty and sourdoughy!) but only a few scant bubbles were rising to the surface. More great advice came flooding in after I published Episode 1 of the Sourdough Saga – including the recommendation not to cover the starter. Perhaps this was where I was going wrong, even with the lid lightly resting on the top of the jar, was I suffocating my starter by depriving it of air? A week after starting and not much was happening, so this seemed a theory worth pursuing. Discarding the lid from the jar, I strapped a little kitchen-towel bonnet over the starter jar with a rubber band. Things did start to look a bit more active on the surface of the starter at around that time. Had I got something right at last? The next morning dawned to apparent disaster. Literally overnight, the whole top of my starter had bloomed with creamy-coloured velvety mould! I was so upset I didn’t even think to photograph it. More desperate scratching through the deeper sourdough-focused recesses of the internets ensued. Someone promised that even really neglected starters, all moulded over, could be resuscitated – but since mine had never yet really come to life, could it work for me? Had I perhaps caused this mouldy horror by leaving my starter uncovered for the surface to dry out? Out of sheer bloody-mindedness, and muttering something about ‘not giving up now’ under my breath, I scratched the furry stuff from the surface of my starter as well as I could. What was left, I mixed with more flour and water (gently warmed, this time) and tipped back into the jar. The starter had developed a ‘winey’ smell I wasn’t at all sure I liked. I got rid of its bonnet, reverting to the loose glass lid, turned my back on it, and leaving it without even my usual gentle words of encouragement, went out for the day, expecting to find more mould & disaster on my return. Six hours later, you might have knocked me down with a feather. The damned thing had bubbled up to very nearly twice the size I’d left it, and was a sponge of small even holes visible through the sides of the jar. I nearly wept. Instead, I swore, colourfully. Not a trace of fuzzy mould was visible. In fact, a better impression of all the ‘happy, thriving starters’ whose photos I’d been coveting on other, more successful blogs, I couldn’t imagine. I tried to share with my lovely husband quite what an exciting turn of events this was. He seemed pleased for me, also somewhat (indulgently) nonplussed. I left it overnight, and fed it again in the morning. Coming home from work tonight, I found it doubled again. I can’t quite believe it. It looks so good, but I can’t convince myself there isn’t still something wrong with it now? I’ve fed it again this evening, getting the volume up so there’s enough to harvest for a loaf or two. Can I just use it, soon? What, if anything, should I be worrying about now?? It looks great, and smells great, it grows like a weed, does that mean it *is* great? Is there any way of telling? This whole process has been the most insane and unexpected emotional roller-coaster ride. Is this just all sent to make me *really grateful* for my new daily bread?? More importantly, my wise blog friends, can I make a mostly-white loaf from a wholemeal starter, or should I stick to matching flour for now? So many questions – so much to discover! 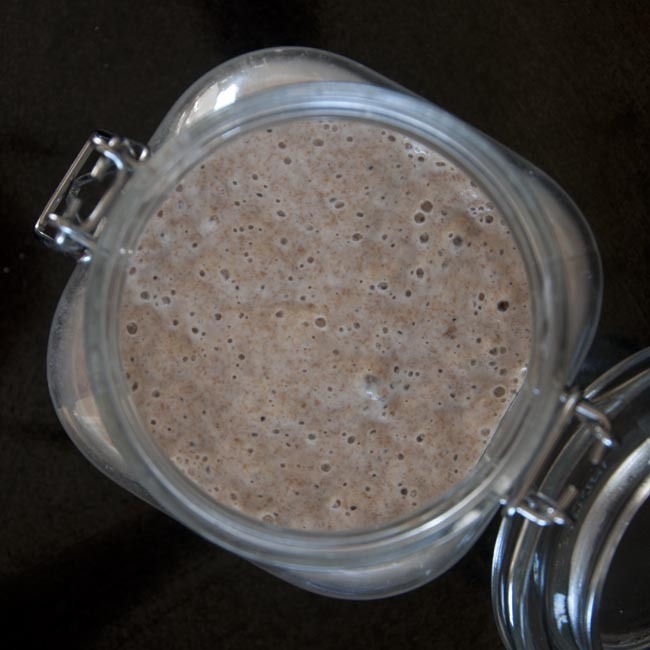 What have I learnt, that might help others trying to navigate the gloomy labyrinth of sourdough starter art and science? Not much, to be honest! Only that there doesn’t seem to be a one-size-fits all set of instructions. In the end, what seemed to work for me – despite the odd speed-bump on the road! – was nice fresh stoneground wholemeal flour, slightly warmed bottled water, and a willingness to just keep discarding and feeding day after day until things eventually came together. My starter hadn’t read the timetable, and probably neither has anyone else’s! Finally, I’d like to offer a huge vote of thanks to everyone – both on wordpress and on twitter – who’s offered me guidance and support on my sourdough journey so far – I would never have guessed there were so many great sourdough bakers out there, so generous with their time, knowledge, and advice! Next – Sourdough Saga: Episode 3 – good things come to those who wait! 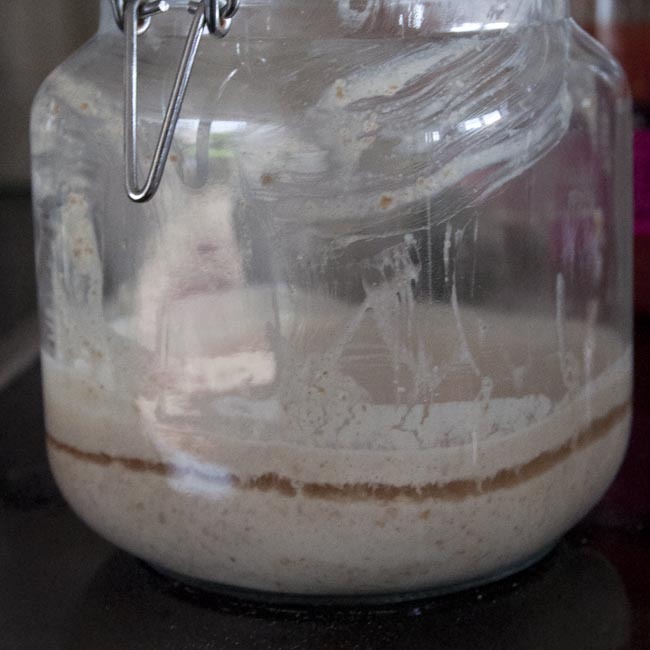 This entry was posted in Baking, Bread, Experimental, Slow Food, Sourdough, Twitter and tagged bread, country skills, food, home produce, sourdough, traditions by Kate Watson. Bookmark the permalink. Good luck with your second effort! Be stubborn, keep at it! Great news! Yes. You can use it now, and yea, you can use it to start a sponge of any flour type, though obviously the end result won’t be 100% pure if, say, you wanted to make a wheat free rye. Personally I feed my starter with wholemeal and make the loaves with white. Looking forward to pics of the finished article! Fate has devised a particularly evil kind of torture for me, and it doesn’t look like I’ve got a plausible baking day with overnight-sponge time until this time next week!! It’s SO UNFAIR! I assume I should put the starter in the fridge for now and then get it out and re-feed it a day or so before I want to bake with it? Established sourdough bakers will correct me (quickly, I hope, before disaster ensues!) but it’s my understanding that I can keep the starter in the fridge as long as I warm it through and feed it before using it, and that it’s the most appropriate way to keep a starter I’m intending to use once a week or so. I was a bit confused by the herman-cake phenomenon, it was a hybrid-thing wasn’t it? Did it have other levening agents apart from the sourdough goo, or am I misremembering?